This summer retreat on the southern coast of Rhode Island is designed in keeping with the local vernacular and with relaxation and fun in mind. 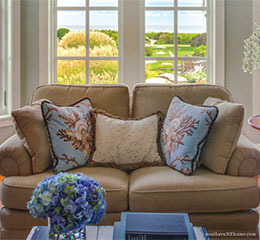 It is a true coastal home captivating readers in the 2015 annual issue of Southern New England Home. Providing a comfortable space, the kitchen designed by Classic Kitchens & Interiors has a generous island with an apron-front sink. The countertops are of mahogany, which adds a beautiful element to the white cabinetry.